In my first hike report for North Carolina's Mountains-to-Sea Trail (MST), I started at the Pender/Onslow county line and began heading 'trail-west' (i.e. toward the Mountains). That hike started on the beach and covered part of the proposed beach walk along Topsail Island and a bit of walking through mainland Surf City neighborhoods. Today's reported hike continues trail-west on a road-walk link that brings the hiker to the threshold of the vast, wild Holly Shelter Game Land. It was all road-walking today - a necessary link, such as even the Appalachian Trail must do to make connections between the best of the scenic areas. And about 4.5 miles of that road walking was along US 17, a busy four lane divided highway that is the major coastal artery through North Carolina. There's no denying that this section of the hike is not particularly pleasing to the nature enthusiast, as the traffic noise and fumes are constant. 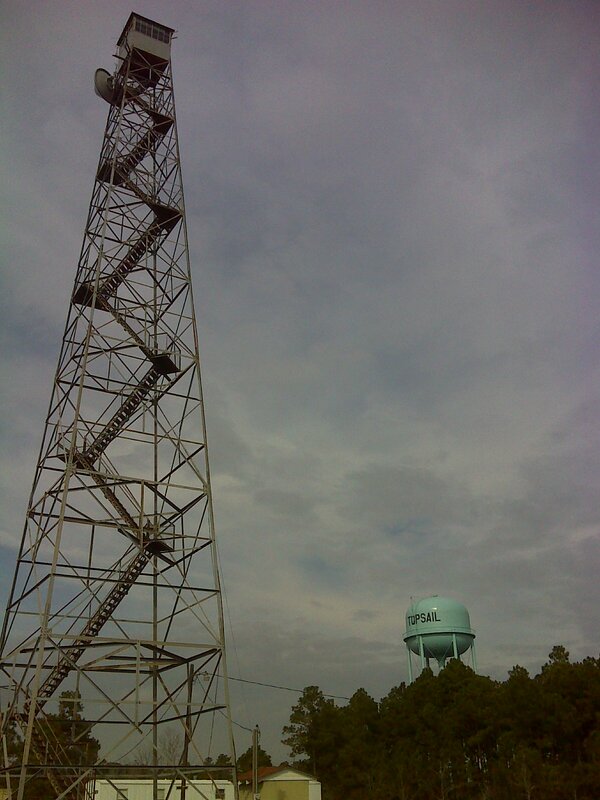 But the shoulders are exceptionally wide and there are some interesting landmarks, such as the old fire tower that, in bygone days, kept vigil over the adjacent fire-prone Holly Shelter area. 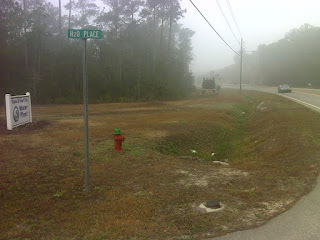 And there's promise that the US 17 road walk here can be entirely eliminated with the construction of some three miles of trail through a publicly owned arm of those Game Lands that comes out on US 17 right where it intersects with NC 210, the road to Surf City and the beaches of Topsail Island. At this intersection the eastbound hiker will find the first welcome services and resupply after a long trek through the wild public lands (see upcoming reports). Here there is a large Harris Teeter grocery store that is open 24 hours, and for a cold drink there's also a convenience store at an Exxon Gas station. 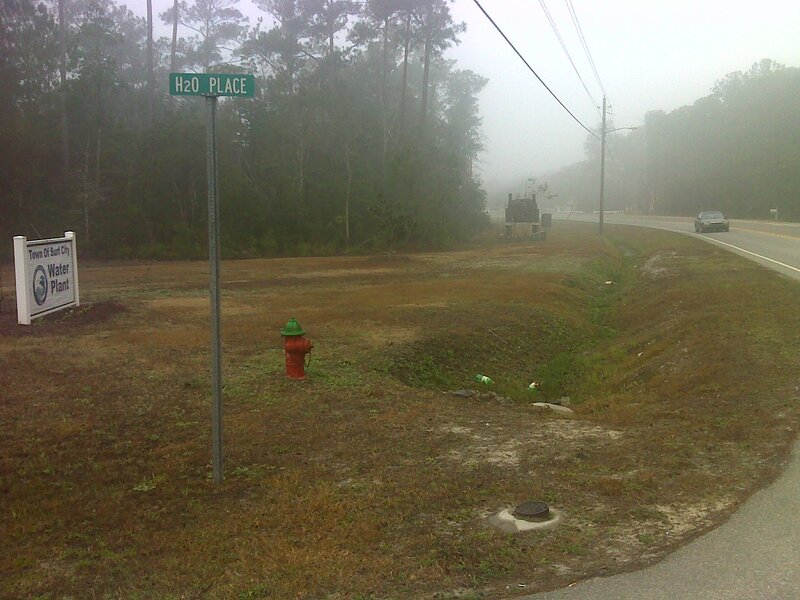 Foggy scene along NC 210 at Surf City city limit. The walk along NC 210, about 2.5 miles, is a little more serene, though this is still a relatively busy thoroughfare. All the road walking today was actually well off the pavement on wide grassy shoulders. In fact, the west/north shoulder of US 17 is unusually wide because it incorporates an old abandoned railroad line and an existing fiber optic cable right of way. 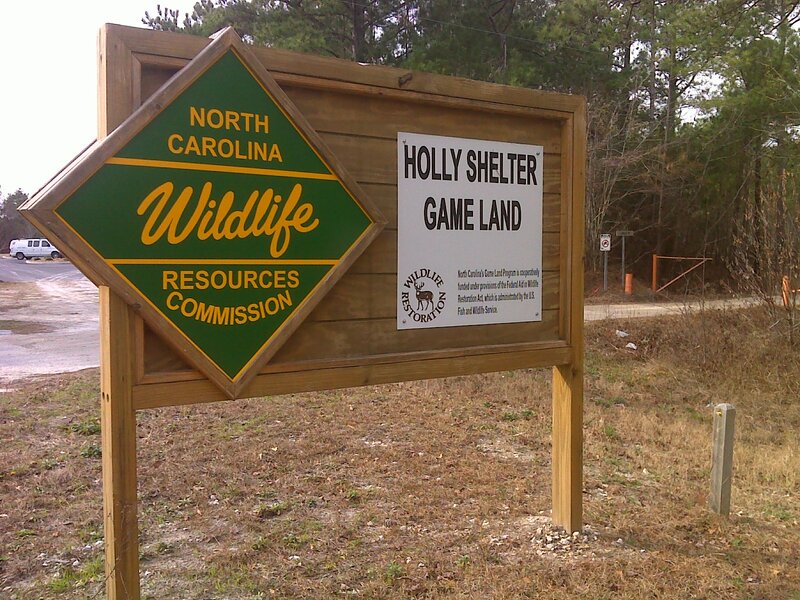 The pay-off for this seven mile road walk comes with the next section, because today's walk ended at the entrance to the Holly Shelter Game Lands (sign shown in the headline photo up top). My hike took place in variable and changeable weather. It was very foggy early in the morning, then mild to warm, almost summer-like, before a wind shift brought cooler air down from the north. But cool is a relative term in this case. At no time did the temperature get below the upper 50's F and during the late morning I was uncomfortably warm with the sun shining, temperatures in the upper 60s, and noticeable humidity -- all in all not bad for a January hike in coastal North Carolina.